SC Appleseed often hears from individuals struggling to move past a prior mistake or criminal record. Sometimes a single mistake made when you are young can have a lifelong impact, like this young man who was convicted of a drug charge while in college. 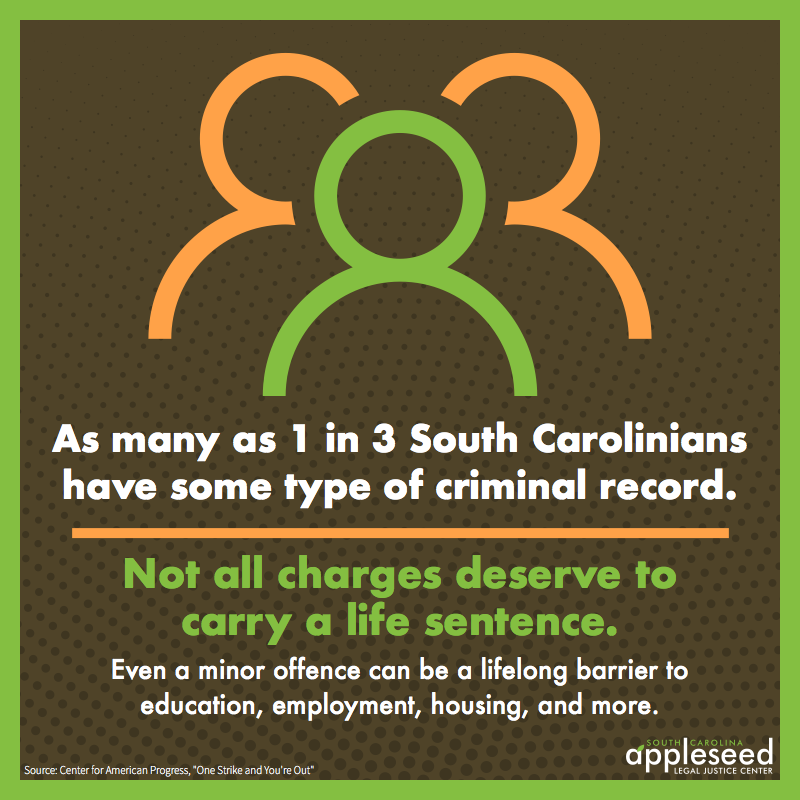 SC Appleseed is working hard to remove barriers to opportunity that result from a criminal record. Here is an account from a guest blogger, who wanted to remain anonymous since he knows first-hand the stigma that is attached to having a criminal record. I am a 32 year-old stay-at-home dad to two children, one 3 year-old daughter and one 17 year-old stepson. My wife is a military officer, currently on a yearlong deployment overseas. When I was 19 years old I was convicted in South Carolina on a drug charge. At the time of my conviction, I was a rising sophomore in college, interning at Merrill Lynch in Charlotte, NC during my summer break. One night when I was home visiting, a friend and I were driving to my house and were pulled over for speeding. There was more than an ounce of marijuana in the car, and as a result we were both convicted of possession with intent to distribute marijuana, a felony. This was the first and only arrest in my life for any reason. After my conviction I went back to college and graduated with a B.A. in Psychology and a minor in Business Management. I had worked a full time job throughout college and finished with above a 3.0 GPA. I was interested in both financial advising and pursuing further education in psychology; however, I quickly found out that convicted felony drug offenders face insurmountable opposition when applying for professional licensure of any sort. I applied for any job I could think of, even jobs that did not require a college degree. I applied for everything from gas station manager, to sales associate, to factory worker, to entry-level positions at Bank of America. I never made it past the first interview with any job. I then decided to change course and pursue my passion in fitness. I became a nationally certified personal trainer. Even with a national certification and a college degree, I was turned down for every single training job I applied for because of my criminal record. I was eventually able to find work, but only when I did not disclose my criminal record and was lucky enough that the company did not process the background check. About a year later, I was offered a great salaried job in gym management, only to be hired and fired within two weeks because my record came up and they decided to let me go. Five years after my conviction, I applied for and received a pardon from South Carolina for my crime, but this proved to be only a superficial benefit because my criminal record remained unchanged. Unlike expungement, which would seal my criminal record and remove the charge from my criminal history, a pardon is the state “forgiving” me for my past behavior, but not forgetting. With just a pardon, this charge will always show up any criminal record check that is done on me. Under current South Carolina law, there is no way to clear this from my record, regardless of how much time goes by. Thirteen years after my conviction, I am still not even able to be on an apartment lease, which is quite troublesome because being in a military family, we move around a lot. There have been situations where my wife and I have had to wonder how we are going to put a safe roof over our children’s heads because so many apartment buildings have denied our application due to my conviction. While I have made peace with everything and found a niche in being a stay-at-home dad and military spouse, I often wonder whether it makes sense for me to continue being punished for something I did when I was so young. Surely I made some poor decisions as a young person, but should there be no limit to the repercussions? At the time of my arrest, I lacked even a small amount of street smarts. My naivety about the criminal justice system was only surpassed by my lack of understanding about how this would impact my future. I am now aware of two programs, Pre-Trial Intervention and the Youthful Offenders Act, both of which could have made this an expungeable offense. I do not know why these programs were not offered to me, since I was both a first time offender and a youthful offender, but it is too late now and under current law, my charge is not eligible for an expungement. My hope is that South Carolina comes to realize that a lifetime of punishment for a youthful mistake doesn’t help anyone. Unfortunately, this story is not unique. So many people are struggling to secure employment and safe housing but face a lifetime of punishment for their past mistake. SC Appleseed is looking to open up paths of opportunity for people with criminal records by working to expand expungement laws and find other solutions to increase opportunities. To access resources on this issue, click here!